Welcome to the Wonderland! Don't miss this chance to take an unforgettable adventure with one of the JackpotJoy's most enchanting Slots yet! Win with up to 100 lines, discover enchanting bonus rounds and you could find yourself winning one of 4 magical Progressive Jackpots available for different coin demoninations. 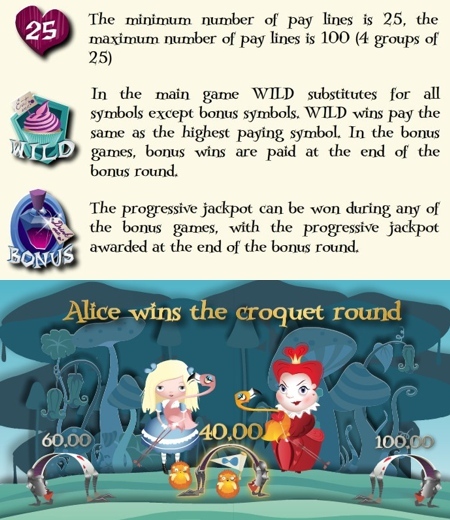 Just imagine winning cash while playing croquet with the Queen of Hearts, sitting for tea with the Mad Hatter or painting the roses red and getting paid for it! There's a surprise around every corner in Wonderland - and each one comes with arms full of lovely money for you. Alice and the Queen of Hearts are competing in a croquet game. Select who you want to play with and choose the correct hoops to win rewards and beat your opponent. Watch out for the special bonus round if you win the game. You are invited to the Hatter's Mad Tea Party where there is always more to drink! Click on the excited teapots to reveal cash rewards, and keep an eye out for the little Dormouse. The gardener cards are trying to paint the roses red before the Queen sees their mistake, but they need your help! Click on each white rose to paint it red and win coins, but watch out for the angry Queen. The Soldier Cards are trying to shuffle themselves, but are making a complete mess of it! Choose the next card and if it's higher you'll win a cash prize - Aces are high! But beware – the Queen is in the pack somewhere. How to Win the Progressive Jackpot? Increasing your coin size will increase your chances of winning the Progressive Jackpot. Activate all 100 paylines to boost your chances of winning on each spin (bet from £1). There are 4 Coin size games with 1p, 5p, 10p and 20p coins. The biggest Wonderland-type jackpot of £1,963,088 was hit on Tiki Temple slot at JackpotJoy by Mathew G. in August 2010.